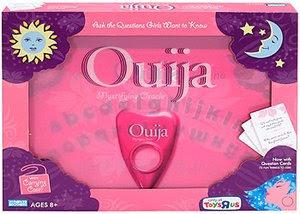 Thankfully, though, there’s a company out there brave enough to tackle the differences between girls and boys—more specifically, the difference between the way boys play Ouija and the way girls play Ouija. Because when men are pretending to contact the dead, they’re all like, “Is there a ghost here?” while women are all like, “Who in this room is jealous of me?” Am I right? Pink & purple. Wow. I always remember that episode of "Little House on the Prairie" when the blind girl asked what colour they painted the barn. Pink and purple. She was happy she couldn't see it.Yucky and cliche, a double threat. Jason, that’s not humanity. That’s marketing.Pink princess woo. How can you not love it? Oh, wait…. I think you people need to examine your assumptions. You are assuming that the different style spirit contraptions are designed with the mortal user’s sensibilities in mind. It may well be that these different designs matter more to the ghostly spirit being contacted. You mortals are so self-centered. What has pink done to deserve this kind of abuse? I should know better than to expect justice in the world, but a perfectly innocent color? Where's the record department, please?